Lily plays shy, by Fig and me. Oh sweet Lily, come on, don't be shy! We can have so much fun together! I promise to find you a friend, one that you can play with all the time and never has to go home. I promise. Lily is a little doll that loves, just loves bunnies. She is mesmerized by their soft fur and their puffy tails. Even though is nearly Christmas she keeps wishing Easter comes soon, never too soon for her. I've tried to show her the delights that Father Winter brings this season, but other than seeing hares and rabbits change colour and to find their trace on the snow she is so not impressed. One of Lily's favourite things to do is to play shadow puppets. She tries and tries, and twists her fingers this way and that, to make her beloved "wabbits" on the wall. Sometimes she succeeds and then she giggles…other times it takes her forever to get it right, but if you help her she becomes your best friend instantaneously. After a night of having way too much fun playing with shadows, we went into the attic to get "just one more box of Christmas", and what do you know? Lo and behold, she found herself a little Mrs Wabbit, all for herself, the entire thing! Oh, I wish you could have heard the giggles, and the joy and the silly things she said to Mrs Wabbit upon meeting her. Not a day later and they have become quite inseparable those two. Little Lily under the tree, making mischief. By Fig&me. So without further ado, I present you the mysterious little girl with the chubby fingers. Lily wanted so very bad to make rabbits on the wall that I just had to figure out how to do it (making fingers for her of course! which were extensively needle felted around a core of bent pipe cleaners so that there are no live ends). Lily is a figlette doll of the 18" size, with very slim construction and many sculpted details: ears, pronounced cheekbones, chin, fingers, knees and even a bum!. She is made with swiss cotton jersey and stuffed with wool. Her hair is wefted mohair and can be styled and played with extensively. She is wearing a long japanese linen dress, cotton undies and very tall wool hand knit boots. Mrs Wabbit is made with vintage linen and cotton, stuffed with wool as well. She is string jointed so there is some mobility to her limbs, she can sit and stand propped, her dress is not removable. This set of toys is appropriate for a child 5+ and is available for purchase comment style. If you wish to enter your name and offer them a home, please fill in the form below and we will select a person at random tomorrow Thursday December 12 at 9 PM. Their price is $595 USD plus postage. 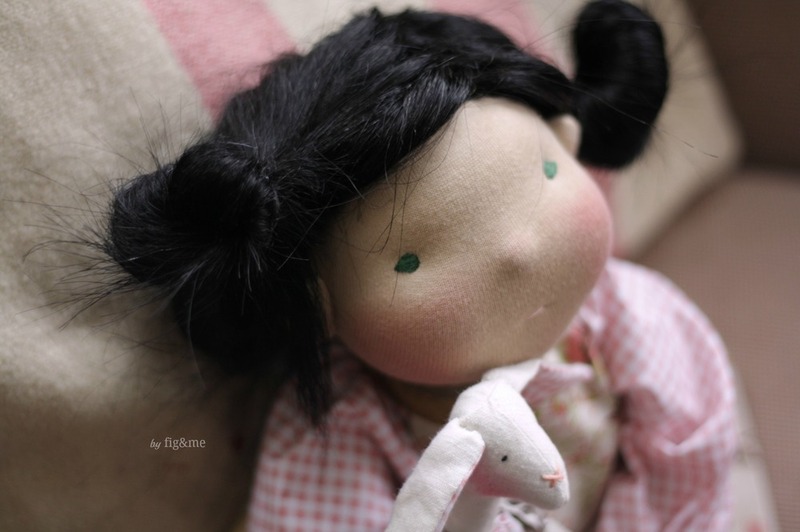 In the mean time, little Lily awaits to find out where she will be heading, and is tucking little Mrs Wabbit to bed. We will see you all tomorrow night, good luck to those who enter their name!.